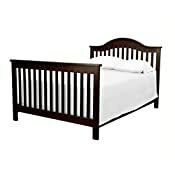 Features: Finish: Espresso; Material: Sustainable New Zealand Pine Wood ; Crib Size: Standard Convertible; Converts to toddler bed, daybed, and full-size bed; Full-size Conversion Kit NOT included; Adjustable Mattress Levels: Yes - 4 Levels ; Includes: toddler rails to convert to toddler bed and polyester cloth binding mattress with triple laminated cover; Non-toxic finish; Lead and phthalate safe; Fixed side rails. 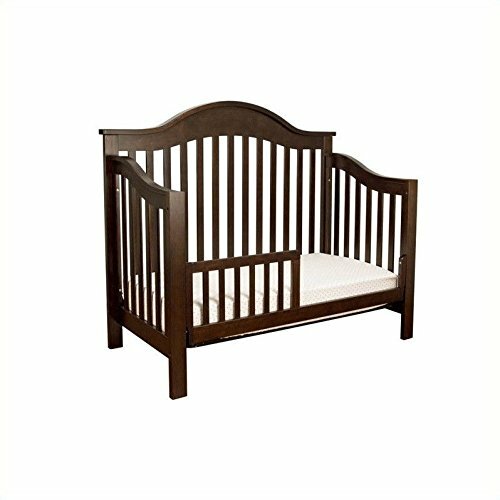 Matching Add-Ons: DaVinci Jayden 4 Drawer Dresser in Espresso SKU: M5922Q; DaVinci Jayden 3 Drawer Changer in Espresso SKU: M5925Q; DaVinci Jayden 6 Drawer Double Dresser in Espresso SKU: M5966Q. 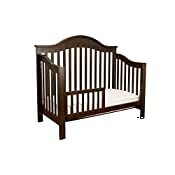 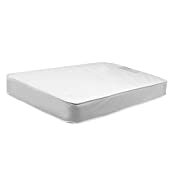 Specifications: Assembled dimensions: 48.375"H x 58.25"W x 31.125"D; Weight: 59.5 lbs; Slat strength: 135 lbs; 1 year warranty; JPMA certified; Meets ASTM crib safety standards and US safety requirements. 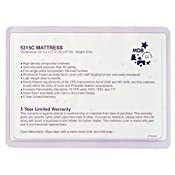 *NOTE: Stop using crib when child begins to climb or reaches 35"